Instant pot bone broth is a total game changer if you love to make your own stock for soups and other things. It’s so easy, nutritious, gelatinous and done in record time. 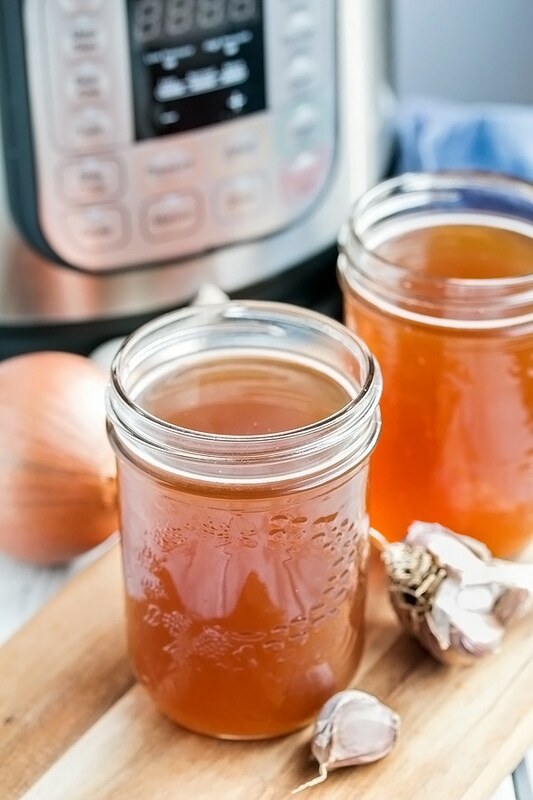 Have you ever made your own bone broth in a crock pot or on the stove only to have it burn? Or have you had it simmer along for hours/days and not turn out gelatinous? 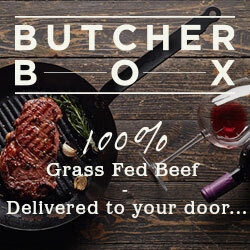 Are you tired of waiting for days to be able to use your nutritious liquid gold? Does your husband complain about the smell or about the stove being on all night? 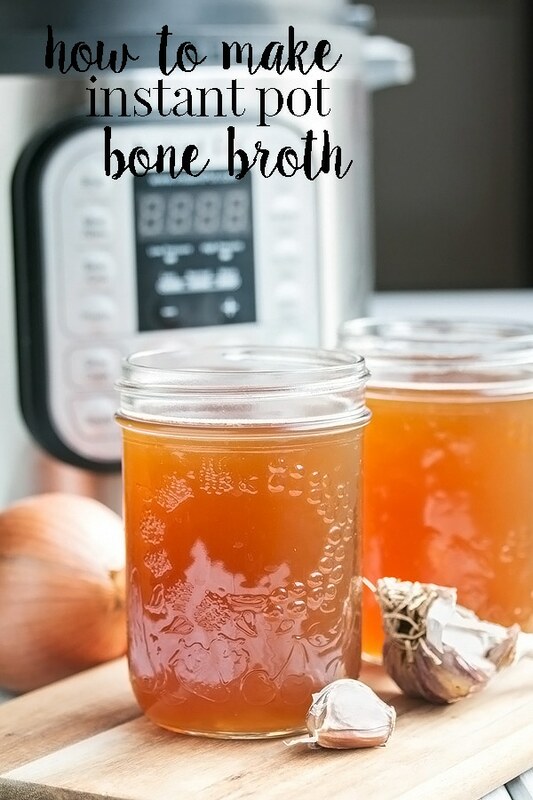 Or have you never made your own bone broth before? If you answered “YES!” to any of these questions, then we have the solution to the problem. Instant pot bone broth! It’s so dang quick and it turns out perfect EVERY SINGLE TIME! I love my bone broth. I almost always make my soups with bone broth and I often drink it straight when I’m sick or for its gut healing properties. Soup made with bone broth is ALWAYS better, but if I wanted to make soup with bone broth, I used to have to start 2 days before I actually wanted to eat the dang soup! 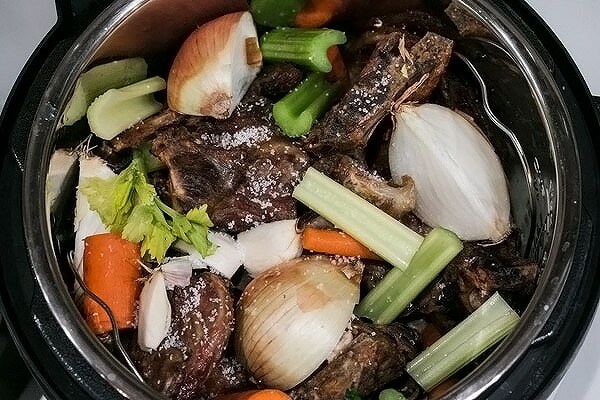 I used to make my bone broth on the stove, simmering for 24 – 48 hours, but then my husband didn’t like the gas stove being on all day and all night. Fair enough. So I tried to make my bone broth in the crockpot slow cooker. Well I don’t know why, but it seemed to burn my bone broth more times than not. So I went back to the stove. What could I do? Once you start making your soup with bone broth, you can’t have it any other way. When I heard about bone broth in the instant pot from my girlfriend Jenn, I had to try it out. I ordered the biggest version, the 8 quart size, and it has forever changed my bone broth making experience. Instant pot bone broth takes 4 hours! That’s right, 4 hours! That’s huge. Now when I make my instant pot bone broth, I can use it for soup in the same afternoon! I can now make soup with homemade bone broth in about 6 hours. Total game changer. 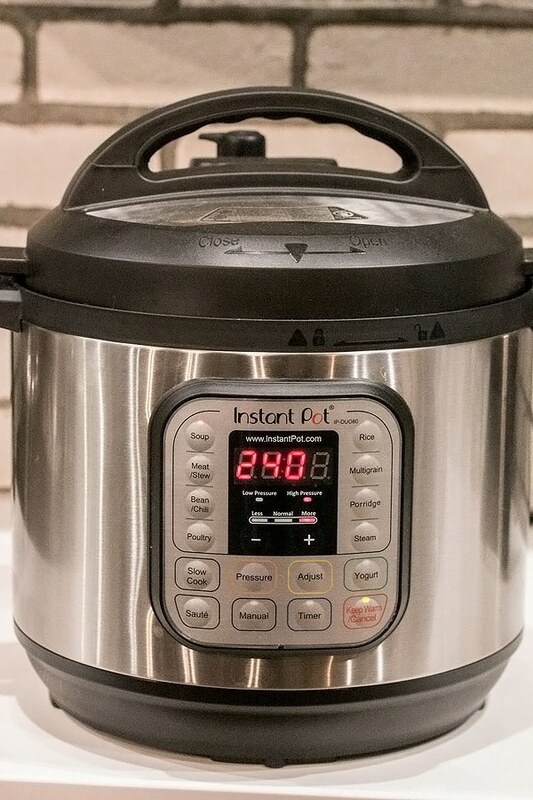 Plus… the instant pot will keep the broth hot inside until I am ready to use it so I can throw my bones in the instant pot in the morning and its ready when I get home from work. Then all I have to do is strain it and make my soup. Soup takes less than 30 mins to make and I have a really nutritious, comforting meal for my family. Not surprisingly, my instant pot bone broth is honestly better than any I have ever made on the stove. It’s gelatinous and mineral rich, flavorful without ANY burned taste and it makes my soups taste absolutely amazing. My husband is not a soup man, but every time I make soup, he tells me how good it is. Its all thanks to the broth. 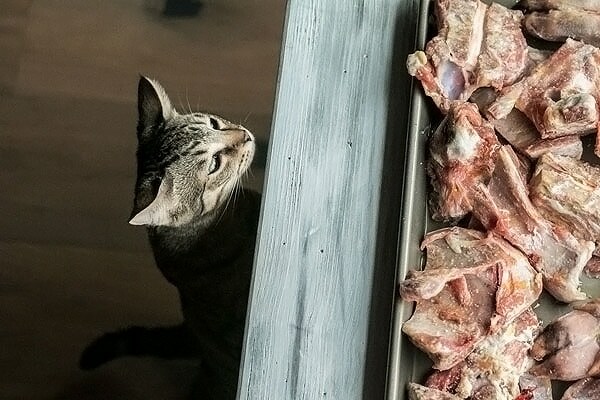 Start by roasting your bones. This step is optional, but it will impart an extra beautiful flavor to your bone broth. Its worth the effort. Drizzle olive oil on them and sprinkle with salt and roast them for 45 mins at 425 degrees. Flip them once, half way through. Add the bones to the instant pot then add your veggies, apple cider vinegar, and water up to the maximum liquid line on your instant pot. Close and lock the lid, make sure the vent is in the “sealing” position, and select 240 mins of high pressure on the manual setting. When the time is up, let the pressure release on its own for at least 30 – 60 mins. Otherwise you will have a splattery mess. If time permits, I let the pressure release naturally until the pressure is gone. 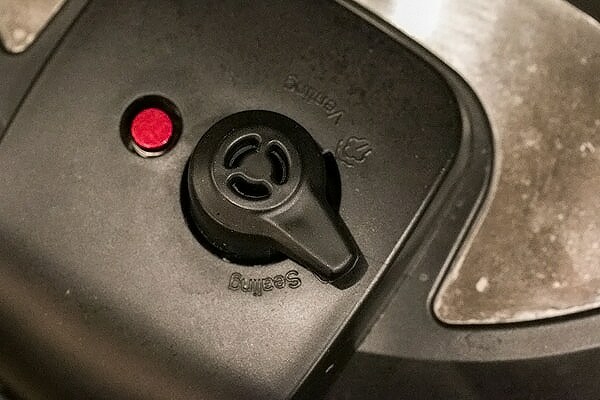 If you are in a big hurry, put a towel over the top of the instant pot and then hit the pressure release valve with a long utensil. Be careful not to burn yourself! Scoop out the bones and veggies and discard them. Pour the liquid bone broth through a strainer into a big bowl or pitcher or fat separator. Use a fat separator to get rid of the fat or put the bone broth in the fridge for a bit and wait for the fat to harden and then scoop it off. Or just let it be. We like to use organic, grass fed, free range bones and veggies in our bone broth. You don’t have to, but we think its important, and besides, you will get the most nutritious bone broth possible if you do. An instant pot! – kinda need one of this to make this. This is the 8qt version and the biggest they have. Bigger is better for bone broth. 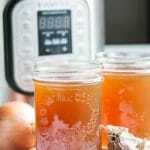 A fat separator – this little tool is invaluable when you are trying to get rid of fat in any kind of homemade stock or bone broth. Or when your trying to make gravy with your turkey drippings. 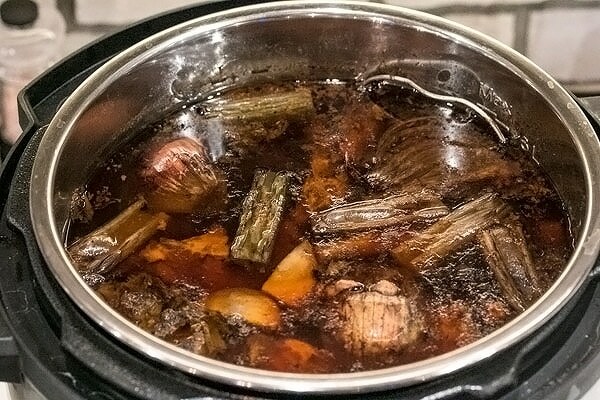 Instant pot bone broth is a total game changer if you love to make your own stock for soups and other things. It's so easy, nutritious, gelatinous and done in record time. Heat your oven to 425 degrees. 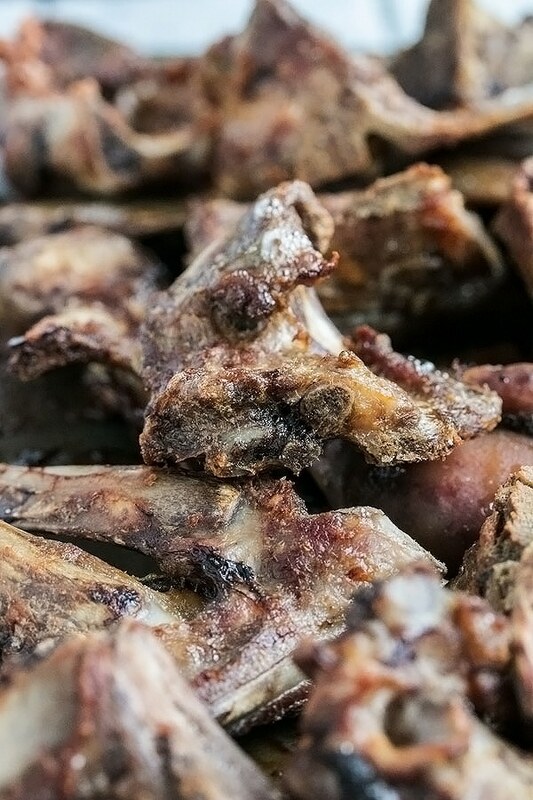 Place your bones on a baking tray, drizzle with olive oil and sprinkle with salt. Roast for 50 mins, flipping over after 25 mins. Add the bones, veggies, vinegar, salt, bay leaves and pepper corns to the instant pot. Pour water over top to the max liquid line inside the instant pot. TIP: pour hot water on the baking tray and scrape up all the brown bits that you can and add those to the instant pot as well. Brown bits = flavor! Put the lid on and close it tight. Make sure the vent is in the sealing position. Select the "soup" function and add time to 240 mins. Let it do its thing! When the time is up, let the pressure release slowly on its own if you have time. If you don't, let it release slowly for at least 30 mins and then cover it with a towel and press the quick release button with a long utensil. Don't get close to the steam, it will burn you! The towel will help to reduce splatter. Remove the bones and the big chunks of veggies. Pour the broth through a strainer and into a bowl or a fat separator to get rid of the fat. Or you can let it cool in the fridge and the fat will harden making it easy to scoop off. Store in mason jars or other containers in the fridge or freezer.